Hello and welcome to the NQ4I web site....this site is for the enjoyment of the contesting and dx'ing operator and includes Aeronautical Mobile operations of NQ4I from all over the world. We hope you find it interesting and will come back for more visits in the future. If you are interested in operating with the NQ4I team in a future contest or maybe a station visit, please email NQ4I. I first got my Novice ticket in March of 1961 and was issued the call sign WN4ARV, I upgraded to General Class the following year. My first contest was the Novice Round Up in 1961 and Field Day in June of 1961. I was hooked on contesting from then on. I continued my contesting activities from college at Texas A & M University at the W5AC club station from 1966 thru 1971. Graduating from college I attended USAF Pilot Training at Vance AFB in Enid, Oklahoma and became a member of the Arkansas Air National Guard. In 1979. I accepted a job with Eastern Air Lines as a pilot and was based in Philadelphia, Pennsylvania. I became a member of the famous Frankford Radio Club and continued my contest education and participation. Charlie, K3WW extended an invitation to become a part of the K3WW Multi-Multi and thence began my interest in Multi-Multi's. In 1980 I flew on the jump seat of an Eastern B-727 to Bermuda and participated in the ARRL International DX contest from Bermuda as WA4ARV/VP9. A number one finish from Bermuda with nearly 3500 qso's with a Kenwood TS-820S and a Butternut Vertical and I was hooked on contesting from outside the United States. In the coming years I would improve as a contester, and become a true force in the contest community. In 1983, after a summer of antenna installations in Haiti, I lead the 4V2C team to a number one in the world Multi-Single operation. In 1984, I went on my own to Guyana, and a number 3 in the world Single Operator All Band effort as 8R1Z. Returning to Guyana in 1985, with the call sign 8R1X, I accomplished my first number one in the World Single Operator All Band finishes. Looking for additional challenges, I spent the summer of 1986 with Frank, 9Y4VU and we rebuilt all his antennas, and added a 2 element Cushcraft 40m yagi at the top of the tower. I returned in the fall for the CQWW SSB test and made another number one in the world finish in the contest as 9Y4TT. Returning in 1987 as 9Y4TTand participating in the CQWW SSB contest; it was a real shoot-out with OH2BH at the controls of EA8BH, I placed number two in the world single operator all band. Beginning in 1991, I entered the Multi category as a participant. The ARRL DX SSB test in 1992, was a number one finish with team mate K4BAI in the Multi-Single category. Numerous Multi-Multi Operations at the old qth were made from 1991-2001. In 2001, I constructed the current qth. It was a fairly large home on 13 acres and provided us with a very noise free location. All power wires are underground and the nearest above ground power lines are more than a mile away. It took approximately 2 years to become fully operational as a Multi-Multi. Current configuration includes 9 towers and over 27 yagi antennas. Eight beverage receiving antennas and numerous wire antennas round the the antenna arsenal. The NQ4I Multi-Multi Team has won the WPX CW M-M US in 2003 and 2007, the WPX SSB M-M in 2004, 2005, and 2006. Numerous single band operations by K4BAI and VE7ZO over the past years has netted a number one in the ARRL 10 Meter Contest, and number one in WPX CW 15 Meter single band and several top ten finishes in CQ 160 and other contests. The NQ4I team is always looking for exceptional operators who wish to join our efforts. We are primarily a non-smoking group. We enjoy the company of contest minded operators and enjoy good food and good times. We have had the good fortune of having as guest op's some of the following great contesters over the years: DF3CB, JG1VGX, K9NW, N5QQ, K8JQ, W4PA, K4JNY, N4AA, AA4S,N4GG,WB4FLB (now K4UU), and AA4GA. I have operated from or used the following call signs: WN4ARV, WA4ARV, HP1XPA, 4V2C, 8R1Z, 8R1X, 8R/NQ4I, K3WW, W5AC, N2RM, 9Y4TT, SM/NQ4I, IZ4/NQ4I. N4FD/C6A, K3KG, 4X6TT, OE/NQ4I, NQ4I, and most frequently NQ4I/ Aeronautical Mobile. QSL for NQ4I operations is via K4PK and LOTW for all major contests. First licensed as a Private Pilot in 1965, Upgraded to Multi-Engine Land in 1969 and Commercial Pilot license in 1970. Joined the Georgia Air National Guard in May 1970 and attended Pilot Training with class 73-04. Graduated and received my USAF Pilot wings in November 1972. First assignment was flying the T-33, T-29D, and C-47 as a Second Lieutennant and the only triple rated Second Lieutennant in the Air Guard. The Next assignment was the North American Super Sabre F-100. Training was accomplished in Tucson, Arizona. Following completion of the F-100 training, I transferred to the Arkansas Air Guard in Fort Smith, Arkansas and flew the F-100 and the F4 Phantom for nearly 10 years. I have attained the USAF Command Pilot rating and wings. In October of 1979, I was hired by Eastern Air Lines as a Second Officer on the Boeing 727 and based in Philadelphia. The employemnt with Eastern lasted until its demise in january 1991. 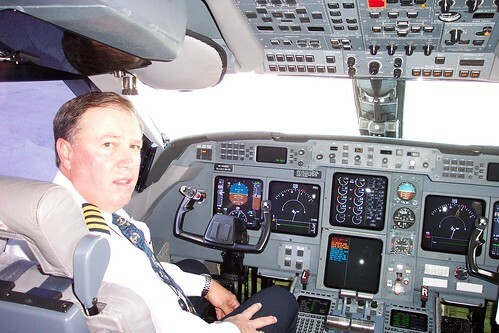 I flew the 727 and DC-9 aircraft as both as a First Officer and later the DC-9 as Captain. Following Eastern, I flew for Express One out of Dallas, Texas and was a DC-9 Captain in the Atlantic City base. After Eastern had folded I was fortunate to be hired by Gulfstream in Savannah, Georgia as a Demo part-time pilot. I got my ratings on the G2, G3, and G4 and subsequently went on to be hired by Executive Jet as a G4 Captain. I have been with NJI, Inc (new Name) as a G4 and G5 Captain now for nearly 12 years. NJI, Inc is a subsidiary of Warren Buffet's Berkshire-Hathaway Company. I currently hold an Air Transport Rating with 6 type ratings and an FAA First Class Physical. My flight time totals 26,200 accident and incident free flight hours.